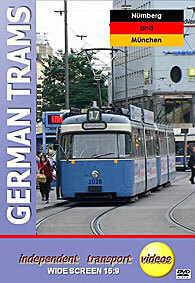 The historic city of Nürnberg (Nuremburg) has an impressive tram and U-Bahn system. For the purpose of this programme, we concentrate on the tramway. Built to the standard gauge of 1435mm the system covers 36.3km. Most of the system is street track with some reserved running areas. The current fleet is made up of low floor Adtranz/Siemens GT6N, Adtranz > Bombardier/Siemens GT8N2 and GTV6Variobahn Stadler cars. Our filming starts at Neutor Graben. Then our cameras move along Westtorgraben, Spittlerorgraben to the busy tram station at Am Plärrer to record the action. We came across an ‘Old Timer’ M.A.N. bus doing some publicity work which adds to the interest here. The next location is outside the Hauptbahnhof where there is plenty of action to enjoy before we head back towards Neutor Graben. Most of the trams are seen in service in their smart red and white livery, some trams are in overall advertising schemes to add some extra colour – look out for the car advertising the tramway museum! The next city to feature on our programme is München (Munich), the capital of Bavaria. This beautiful historic city, with its imposing buildings, fountains and excellent tramway is situated on the river Isar. The system is to the standard gauge of 1435mm and covers 71.2km. The current fleet is made up of GT6N MAN > AEG/Siemens, GT8N2 Adtranz > Bombardier/ Siemens and Variobahn Stadler. They are also still running a set of P3 Rathgeber, München AM4s, dating from 1967/8, which are seen on a number of occasions in this programme. Our filming starts outside the Hauptbahnhof and then moves to the busy Karlsplatz and Sonnenstrasse. We continue along Maximilianstrasse and into the old town for some more action in the historic streets. All types of this smart fleet are captured for you to enjoy from the 1960’s P3 to the brand new Variobahns still being delivered. The evening rush is captured back on Karlsplatz and at the Hauptbahnhof, and to finish off our visit to München we do some night filming at Hauptbahnhof and Dachauer Strasse. Duration : 97 minutes (approx).